Mens Linen suit:: A Convincing Fashion Phenomenon—Selection of summer clothing is always cool and risky; however many of us would prefer to look good and feel cool. Feeling cool alone will not be the main issue but it should appear smooth and crisp. In that case we can select the better option like Linen. While talking about Linen; it is a natural fiber extracted from the roots and stalks of the flax plant which is botanically named as Linum usitatissimum. It is the ancestor for all other natural fibers. Leading countries like China, France, Italy are producing the linen exclusively for its fame as well as to convince this entirely increasing fashion phenomenon. Olden times of Linen:--Its progress was started from 4 millennia back in Egypt. The ancient Egyptians formed a linen fabric manufacturing industry and yielded more as linen clothing. Most of the Egyptians preferred the linen clothing as a major outfit and even they're exported for other countries too. Gradually the impact of linen fabric travelled across the European countries. It attained its popularity in the Northern Ireland countries as well. Then after some decades Ireland became the highest producer of linen and very much popular for the production of linen fabric than others including the Egypt. Within a short span Ireland reached its peak and became the center for linen production across the world. Nowadays they're producing almost all the fabrics typically with linen fibers. During the late 19th centuries suits of all varieties had worn for corresponding ceremonies. In those days the suit fabrics are made of heavy wool and even heavy in weight. They can't be worn for summer season as it made the feel of discomfort. To overcome these issues the linen came into usage, which is a open interlaced thin and finely woven fabric. It reveals the 100% crisp that it would be more familiar, to be worn during the hot summer. From then the linen were worn as a seasonal suit which reached its peak towards different divisions of people. At 1930's mostly high class people worn white linen suit to show their status and wealth; middle class people worn dark shades for illuminating some variations between them. Even though they are not suitable for formal attires, it is used along with some other compensating fibers to make it more flexible for producing the formal suit. Nature of Linen:-- One of the best reasons to have the linen in your wardrobe is due to its flexibility and highly breathable nature. It is more popular for its irregularity of the yarns and reveals the real sign of casual attire. These suits were very much famous for its special characteristics like easy creasing and It is free from lintels; it becomes softer as it is washed more. Another important thing in linen is that it can wrinkle easily(the trade mark of linen), which seems cool and even more as a stylish canvas. Actually a linen suit is the personification of uncomplicated dressing. With this linen a man can glimpse the classy outlook during the summer's hottest and stagnant days. It is not a printed law to wear a full suit with hard looking manifestation during the hot sunny season. Just dump it and feel free to go for the linen clothes; A fascinating man merely likes the linen for its extreme comfort throughout this burning situation. You can say yes and really enjoy the feel of linen when you wear it as your summer outfit. It is one of the most excellent suiting which cannot be left undisturbed during mid-of-march and up to full spell of May. In those days linen clothing works nicely and won't stick to your crust anymore because of its natural creasing effect, it keeps your suit slightly away from the body. Types of Linen:-- Generally the black and white shades are the natural color of linen which will be quiet simple and straight forward. Tan colors are also one of the most accepted colors that are accessible for making the linen clothing. Obviously this fabric can be easily adopted for making any decorative clothing with different colors which can match eventually. People of this new generation got back to the ancient outdated fashion with some coolest form of mix and match combination which are relentlessly increasing. There are four major types of linen fabrics in usage all over the world. Each one is unique in its character and varying size with better specifications. 1. Italian Linen – It is the lightest among others and have uneven yarns; mostly used for the vacationing purpose and wrinkle easily. 2. Irish Linen – Usually this type comes with solid colors and uniformly closed yarns which wrinkle at very rare case. 3. Gabardine Linen – It is very tough and can resist from wrinkle and crease; very thick linen fabric. 4. Fancy Linen – It is blended linen from silk and linen; it can be made with very stylish appeal. Do's and don'ts:-- Line suits are perfectly suitable for casual and official canvas meetings. Make sure to get it pressed before going for the official works rather it seems natural for canvas look with its usual wrinkles but little bit slack for business meetings. It need not be exposed to very high traditional customizing due to its loose fitting character. It can be washed and even pressed with little bit hotter ironing. Usually avoid continuous pressing as it may break the natural wrinkles. It is better to keep away from self washing which would destroy its canvas and should be dry cleaned. 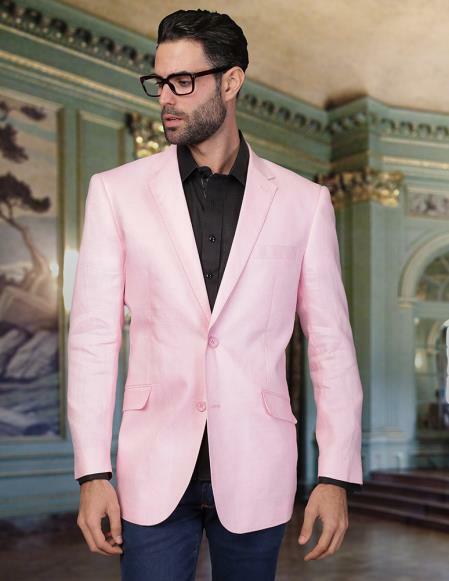 If you're looking for a low budget suit you can avail the linen bespoken suit which is reasonably simple at MensUSA. 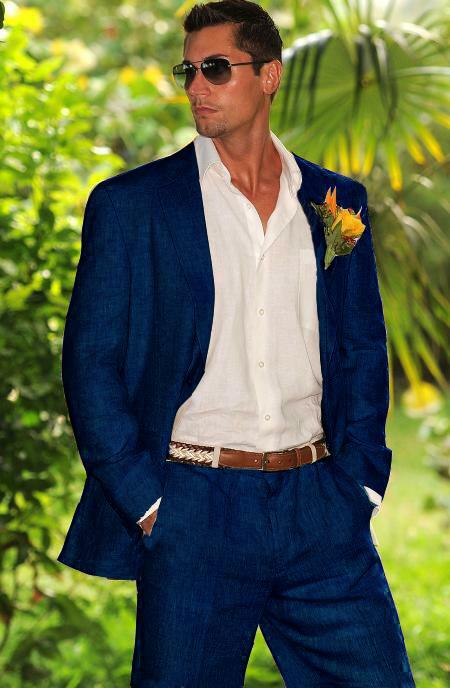 We're providing a wide range of high quality linen suits with various optional categories. Our huge collections will be apt for your specifications. Hereby we acknowledge with our best in comfort and style even more with our variety of shades without any imperfections. Surf through our catalogs and select your best fit for your best performance.